Most trusted, second year running! 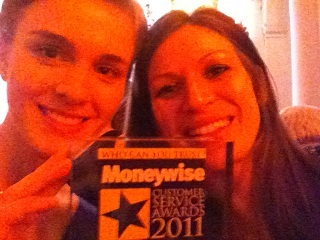 Yesterday was a big night for the nation’s financial services industry – the Moneywise Customer Services Awards 2011 were staged at the glamorous Northumberland (photographic evidence on our Facebook page). Caroline and I joined the in-crowd and waited in anticipation for the announcement of the winner in the category ‘Most Trusted Personal Loans Provider’ where we featured proudly on the shortlist alongside First Direct, Nationwide, Tesco Bank, Sainsbury’s Bank and Natwest. After a scrumptious dinner (of which photographic evidence is not available, due to bad lighting and rumbling, impatient stomachs), the happy news was announced to the tunes of Bob Marley’s Three Little Birds: Zopa is the UK’s Most Trusted Personal Loans Provider 2011, for the second year running! Last year, we were thrilled to take the crown and we are over the moon that we have once again been voted to the top spot by our lovely borrowers – thank you to everyone who gave us their vote, we look forward to another year of great service! And just to put this into context: Over 12,000 British consumers participated in the survey and had their say on how their financial service providers performed – what a sample size!